In the third day of the Shreemad Bhagavatam course, Sri Swami Vishwananda spoke on many stories of the great bhaktas of ancient times - kings, sages, and householders who developed an extraordinary devotion to God. We'll share examples later on in this post, but the theme is the same: the Lord is ever-present, and is always with every single person. Despite difficulties, and no matter what purifications we undergo on the path towards realising the Lord, He is with us, taking care of us, constantly. Because of the many beautiful stories that Swamiji spoke about during the course, we'll cover the stories over two posts. Even some saints have difficulty renouncing the outside world: Many saints, such as Annamacharya, Ramadasu - even if they were born with great spiritual merit from their past lives - had to go through great trials during their lives. However, when they received the Grace, they got realised. 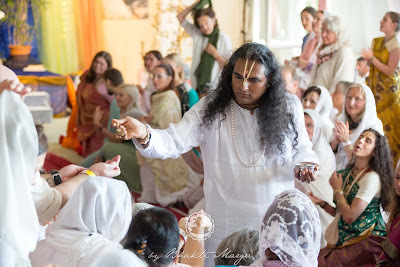 Swamiji spoke about this in connection to our own struggles on the spiritual path: To attain that Grace is why you are born. There are three 'truths': God, the Guru, and you. All else is illusion. "Bhaja Govindam" song commentary: Swamiji spoke about the famous song of Adi Shankaracharya, on how a life of collecting knowledge for the mind is useless: the only activity that will free one's soul is chanting of the holy Names of God. Rishabhadev: We learned about the life of the incarnation of God as Rishabhadev: the founder of Jainism, and an amazing king who made great progress for early humanity as a ruler. He left his kingdom to his 100 sons, and traveled the world spreading teachings of the greatness of the Lord. He taught the people about non-violence, of the "yam" and "niyam" of life - the "do's" and "do not's", but that one should not forget about the Creator - that people should pray to Narayana because He is the ultimate salvation. Sage Bharata: Bharata was the first of 100 sons of Rishabhadev. All of the sons were virtuous people, but when Rishabhadev became old and decided to leave his kingship to begin asceticism, Rishabhadev named Bharata as ruler of the kingdom. Bharata ruled for a long time, justly and wisely, before he also became old, and retired to the forest. He became a great sage through practicing much penance. Once, he came across a motherless baby deer, and feeling pity for it, he raised it with great care and affection. As the deer grew, he continued to look after it, rarely ever being apart from it. He cared for it so much, that at the time of Bharata's death, his last thought itself was on this deer. Due to this last thought, Bharata's next incarnation was as a deer! Due to his punya from his prayers, he was able to remember his last life, and its mistake, and he renewed his focus for the spiritual path, eventually attaining the Lord. Achamila: A Brahmin who lived in accordance with all the proper rules of life, fell into a sinful lifestyle. By 'accident', with his last thought before death, he called out to his son whom he had named Narayana. Through the holy Name of the Lord, he got a second chance at life, and this time, attained heaven. Dhruva was born to a royal family, as the grandson of Swáyambhuva Manu - the first human of this age - and great-grandson of Lord Brahma. Dhruva's father, King Uttanapada, had two wives: Suniti, and Suruchi. Queen Suruchi, the king's favorite, had a son named Uttama, and Queen Suniti had Dhruva. Once, Dhruva saw Uttama sitting on his father's lap, and had a desire to also sit there. He started to climb up onto the throne to join his half-brother, when queen Suruchi stopped him and scorned him for trying. 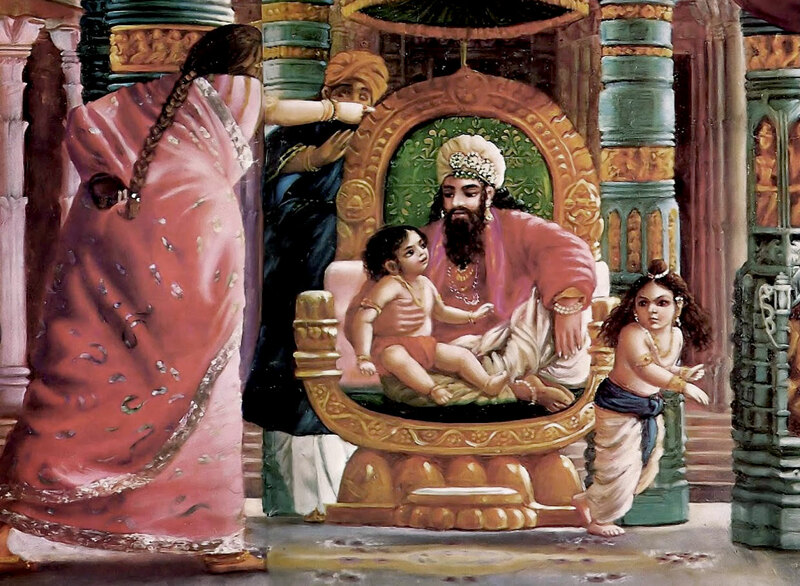 She explained to Dhruva that because he was born from king's less-favored queen, he would never be worthy to be next to his step-brother on their fathers' lap (on the king's throne). Dhruva was very hurt, and went to his mother for some solution to his pain. She said that, despite the sting in the words of Queen Suruchi, Dhruva would not be able to solve this by going to the king or to her. She suggested that he should go do penance, to pray to the Father of all - Narayana. Dhruva left the palace to go to the forest to do penance. He was only 5 years old. He sat down in the wilderness, and began to chant: "Om Namo Bhagavate Vasudevaya". 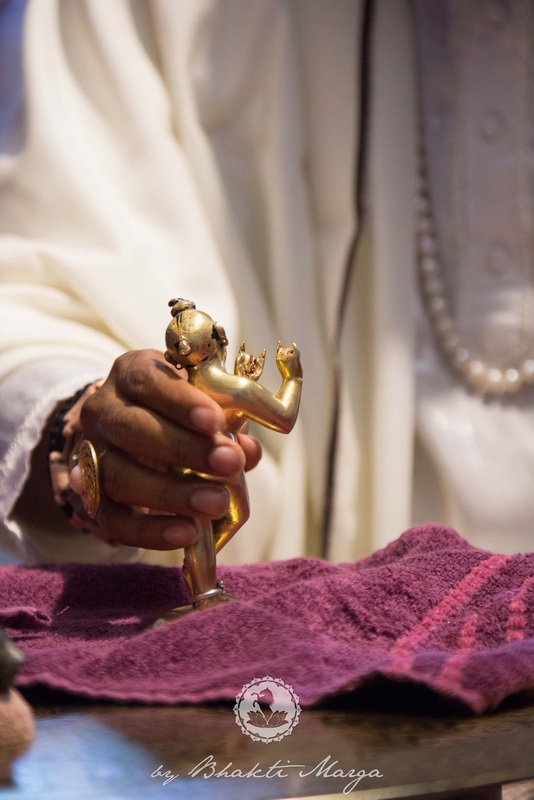 Devarishi Narada, who had heard this news about the little prince, approached him, and advised him that he was on a foolish journey that he could not complete. He was just a small boy! 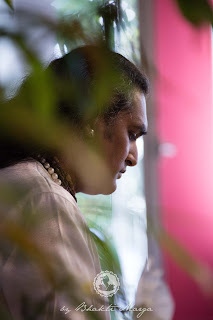 His focus should be on going through the four stages of life, the four ashrams, but here, he had jumped directly into the last stage - renunciation of the world in pursuit of the Divine - and was trying to complete what many yogis had not been able to achieve after many lives of hard penance! Narada said that he should give up, go back to the kingdom, and that he should try this path when he was older. Dhruva replied with respect to Narada, that he was determined to complete the path he had chosen. 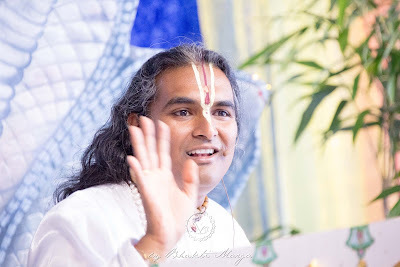 He asked that the Devarishi teach him how to attain the Grace of the Lord. Narada, touched by the boy's resolve, instructed Dhruva in how to chant the Divine Names. Dhruva began immediately, and with an intense focus, attained a very great state of meditation on the Lord in a very short time. Through his penance, even the devas, including Indra, the king of the devas, became nervous. He imagined Dhruva was doing so much penance to overpower the devas. Seeing this, Narayana Himself explained to them that Dhruva's motives were pure - if he wanted any material gain, he would be praying to Brahma or Shiva instead. 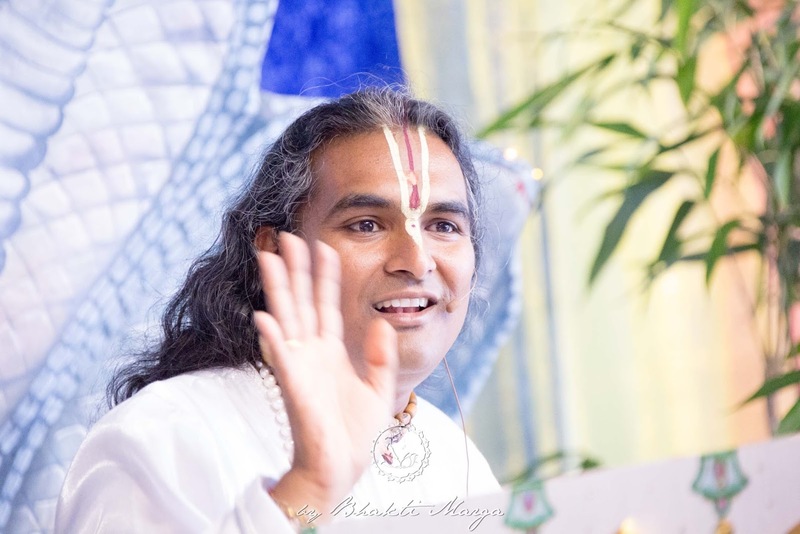 At last, Bhagavan, seeing the intensity of his love, appeared in front of him and blessed him. And Mahavishnu took Dhruva in His lap. So Dhruva was in bliss. He had this great joy inside of him. Yesterday I was saying that once you are grown up, one doesn't cry for God, na? Only the child cries. When the child is born, the first thing he does is start crying, “Oh my Goodness, I'm back again into this world”, na? And the child, he doesn't need to do anything. He just needs to cry, and the mother will run, and the father will run and automatically they will know. The same thing with God. Here He said, “Now that you have grown up, you are so proud that you know so much.” He said, “No, let go of this! Be like a child!" 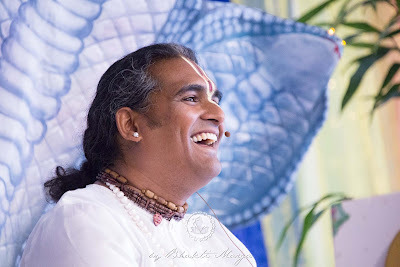 In the Bible Christ also said, “To enter the kingdom of God you have to be like a child.” He said here, “Be again like a child, cry for Him, call for Him!” When He hears your sincerity, when He hears your true cry from wherever He is...you know, He can be in Vaikunta, Goloka, wherever He is...He will come. But that cry has to have bhakti inside. It has to have this longing inside. That's what will pull Him. That's what will kidnap Him from wherever He is. You know, it's so easy. You just need to cry with devotion. You need to cry with love. Mahavishnu blessed Dhruva by putting His conch on the boy's cheek. Having attained this Grace of the Lord, Dhruva went back to the kingdom. His father had been in a great state of regret, thinking of how he had treated his own son without compassion, and had sent the army to search for Dhruva while he was meditating. Swamiji related Dhruva's homecoming to the biblical story of the prodigal son. 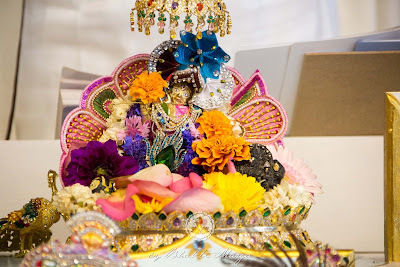 Upon returning home, Dhruva went to his father and his step-mother, and bowed down at their feet - to Dhruva, it was due to their actions that he went out and received the Grace of the Lord. Later, Dhruva was crowned as the king, and his father went into the forest to do meditation and penance. Dhruva would go through battles with demons and yakshasas, would receive a boon from Kubera, and would rule the kingdom with piety and devotion for many years. Throughout it all, he was so rooted in the Name of Narayana that nothing could move him. At the end of Dhruva's life, Narayana Himself came to receive him. Suniti, Dhruva's mother, attained heaven. Through the blessing of Brahma, Dhruva was given the place of the North star - the "pole star" of the northern sky, which all other stars revolve around. Swamiji spoke about this story being a reminder for us to attain God-consciousness. Once that is attained, nothing can move you.